Still not convinced? Let’s take a look at some powerful statistics about social media marketing for business, then we’ll find out why SMM presents such a great opportunity for freelancers. Finally, we’ll dive into how to sell the service, based on all the information we learn. Let’s get started. Businesses from almost every industry have some sort of social presence. As a freelancer, you may focus on certain industries, but it’s likely that you’ll accept clients from several different industries. Either way, it’s likely that your clients and potential clients either have an existing presence on social media, or they want to. And if they don’t want to? It’s your job to convince them. The argument for social, both for the freelancer’s offerings and for the company’s investment, is supported by some pretty convincing data. As of March 2016, Brandwatch reported that there are 2.3 billion active social media users worldwide. Think about it. 31% might not seem like a lot, but when you think about the people in the world that don’t have access to internet (54%), and children under the age of 14 (26.3%), and the fact that some of those children under the age of 14 are online and on social media, you see that the worldwide social audience is huge. Not only is it huge, but it’s growing. 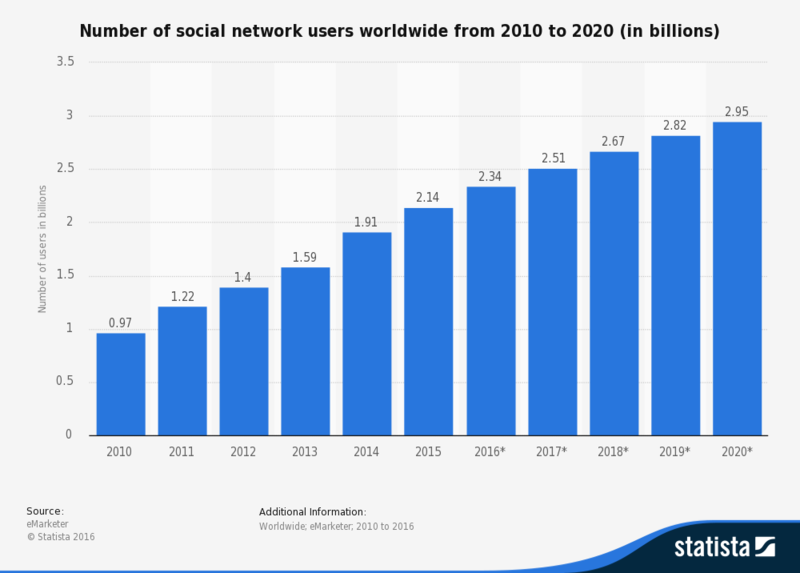 The Statistics Portal projects that the total number of social media choosers will reach 2.95 billion by the year 2020. Statista did a study to determine the leading social networks in April of 2016. 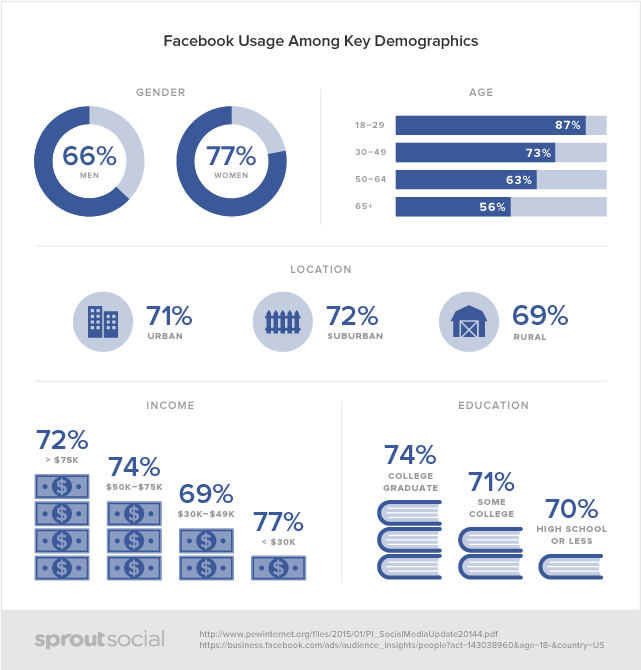 Not surprisingly, Facebook is still the clear leader. They offer statistics on every possible social channel, but we’ll just give you the highlights of the channels you’ll likely be using most. With that many people active on social media (and 1 million mobile social users joining up every day), why wouldn’t a business want a social presence? And, why wouldn’t you, as a freelancer, want to know how to reach those billions of social users? Businesses are catching on. While not every industry, business or executive is convinced of the potential ROI involved with social, they know they have to be where their customers or potential customers are. If for no other reason than the fact that their competitors are already there. Adweek tells us that 91% of retail brands are active on 2 or more social channels. Other sources tell us 83% of Fortune 500 companies have a Twitter presence. TechCrunch tells us that there are 40 million small business pages on Facebook. Businesses are present on social, and a great freelancer knows how to elevate a brand’s social presence, and create valuable and meaningful content that will give great results. So, naturally, you might think that if social media marketing is so important, why would businesses hire a freelancer? Why wouldn’t they get in-house people to do it, or hire a big agency? The answers are pretty obvious, but we’ll delve into them in the next section anyway. Many freelancers use social media to promote themselves. That is a great way to learn the ropes, and you can prove to yourself the power of social – especially when you land a new client. We told you, in the section above, why a business needs social. Now we’ll tell you why a freelancer needs social. The short answer is simply because businesses need social, and freelancers need business. Another reason is that freelancers have a great opportunity with social. Many small and medium-sized businesses choose to hire freelancers to manage social because they don’t have the budget for a large agency, and because they don’t want the overhead of a full time employee. That creates a special niche for freelancers in the social space that might not exist in other marketing functions. For instance, a company might write their email marketing in-house, but outsource their social. What does this mean for you? You’re a shoo-in! This information is just the tip of the iceberg when it comes to understanding the benefit of SMM for freelancers. As a freelancer, you can set your own hours, your rates, and how you’re paid – be it hourly or per project. You have to be conscious to compete with all those people on the freelancing sites, but you can still charge a fair rate that will fall far below an agency rate. Here are some suggested rates. Remember, this is per client, and if you are motivated, you can do SMM for multiple clients. The lower range below is for standard freelancers. The higher end is for freelancers with proven success. Depending on your experience and success rate, along with the number of clients you get, you can make a substantial amount of money as a freelance social media marketer. And, if you’re in the 0-4 year band, just know that every social project you take on gives you the opportunity for success and growth, and brings you one step closer to the next band and more money hourly. So now that you know you need to offer social media marketing as one of your freelance services, how do you build a case? It shouldn’t be too hard, considering we’ve already established how much businesses need social, but you might need a few more pointers. Not all businesses are convinced that they need social. This is a good thing. Many of the businesses that have been on social for a while already have their freelancer in place. It’s a competitive market. While we don’t discourage you from pursuing clients that already have a social presence, it is also good to start new with businesses that have resisted the social movement. Show them social proof – find out their key customer demographic and show them how many in that demographic are on different social channels. Make a chart. Draw a picture. Show them how many clients they’re missing by not being where their clients are. Show them the benefit of social listening – where better to hear a person’s real opinion of a product or brand than on social media. Show the naysayer that social media can give them real insight into the customer mind. Show them the cost of other forms of marketing media and compare it to the cost of social media. Nothing speaks louder than money. Show them the statistics we talked about in the beginning of this post. Once you’ve won the business, you have to work hard to keep it. Tools like PromoRepublic can make post creation a breeze, saving you time, which allows you to take on more clients. Stay tuned for the next post in this series. We’ll be talking about how to find social media clients.